Antarctica had been cloaked in mythology for millennia before humans actually discovered its frozen continental features. The presence of Antarctica was first debated by Greek philosophers who propounded the need for a southern landmass to balance the weight of the lands in the northern hemisphere. Referring to this unknown southern land, Terra Australis Incognita, Aristotle (384-322 b.c.) reasoned that the northern hemisphere lay under the constellation of Arktos (the bear) and that this southern land at the opposite end of the globe must be Antarktikos. Legends of Terra Australis Incognita fascinated societies, particularly in Europe, and it was only a matter of time before cartographers began mapping the world. Placing the oceans and land masses on this global map, in correct orientation (Fig. I), was the real challenge. Even today with the sophistication of satellites and computer-generated images, we are still describing features on the Earth's surface. Amazingly, some of the early cartographers included a southern continent on their world maps, centuries before it was even discovered (Plate 2). These early maps of the unknown southern land, many of which were created during the 15th and 16th centuries, fanned the flames of exploration. Why are humans fascinated with the unknown? The quest to be the first—to discover and acquire riches for ''king and country,'' to plant the flag for one's nation—have been primary driving forces behind exploration. In 1503, in his southern voyage of the Espoir, Binot Paulmier de Gonneville of France landed on a ''tropical paradise'' he called Terre Australe. Sixteen years later, Ferdinand Magellan (1480-1521) of Portugal set sail with five ships to find the ''spice islands'' for Spain on an expedition that became the first circumnavigation of the Earth: from Europe across the Atlantic Ocean, through the Straits of Magellan at the tip of South America, into the vast Pacific Ocean, westward to the Indian Ocean, around Africa, and back to Europe. Magellan was followed by Sir Francis Drake (1542-1596) who, in 1577, was commissioned by the merchants and ministers of England to explore the coastline of the ''continent beyond.'' Drake traveled to 57° south where the Pacific and Atlantic ''meete in a most large and free scope,'' determining that Tierra del Fuego (land of fire) was not part of Terra Australis Incognita. Despite Drake's observations about the frigid region south of South America, explorers could not resist the temptation to speculate wildly about the nature of the unknown southern land. Sailing southward in the Gros Ventre in 1772, YvesJoseph de Kerguelen-Tremerac (1734-1797) returned to France and described a land that ''holds promise of vegetable products . . . South France will provide grain crops . . . masting timber . . . salt works.'' Kerguelen was given a second commission to colonize La France Australe, but was soon discovered to be a fraud with ensuing court-martial and imprisonment for conduct unbecoming an officer. It is equally intriguing to ponder why someone would fantasize such stories and why a government would be willing to accept them. It took the mettle of Captain James Cook to dispel the mystery of Terra Aus-tralis Incognita when, on 17 January 1773, he became the first person to travel beyond the Antarctic Circle. Overcoming nearly two millennia of speculation and surpassing the voyage of his countryman Sir Francis Drake two centuries earlier, Cook traveled into the southern land with its seasons of night and day. Remarkably, Cook sailed safely through towering icebergs and immense cresting breakers in wooden sailing ships—Resolution and Adventure—that were scarcely 34 meters in length and 11 meters wide!
. . . the ice extended east and west far beyond the reach of our sight. ... It was indeed my opinion that this ice extends quite to the Pole, or perhaps joins to some land to which it has been fixed since creation. In 1775, the Resolution returned to England after traveling more than 97,000 kilometers in its amazing 3-year voyage. Why is it important to individuals and nations to establish their priority in discovering new lands or resources? The first person to actually see the Antarctic continent was the Russian Thad-deus von Bellingshausen (1778-1852) who sailed to 69°21' south in the Vostok (East) and Mirnyi (Peaceful) in 1820. During this voyage along the Antarctic Peninsula, which projects like a gnarled finger toward South America, Bellingshausen met Nathaniel Palmer, the 21-year-old American captain of the sealing vessel Hero. Three years later, the southernmost voyage of the 19th century was achieved by James Weddell (1787-1834), who sailed in the Jane and Beaufoy to 74°15' south. During his voyage, Weddell noted that ''not a particle of ice of any description was to be seen.'' Interestingly, as a reflection of climatic variability, it would take until 1911 before another ship could penetrate the sea ice this far south. The vessel was beset with ice, whose pale masses just came in sight through the dim haze, like tombs in some vast cemetery; and, as the hoar-frost covered the men with its sheet, they looked like specters fit for such a haunt The waves began to be stilled by the large snowflakes that fell unmelted on their surface; and, as the breeze died away into a murmur, a low crepitation, like the clicking of a death-watch, announced that the sea was freezing. ... in view of the additions to knowledge in almost every branch of science which would result from such a scientific exploration, the Congress recommends that the scientific societies throughout the world should urge, in whatever way seems to them most effective, that this work should be undertaken before the close of the century. 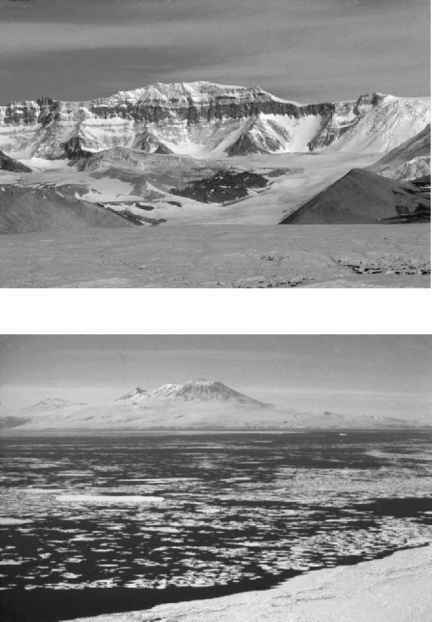 FIGURE 3.1 (Top) Transantarctic Mountains, with its thick black band of coal older than 200 million years, viewed westward from McMurdo Sound in the southern Ross Sea. (Bottom) Sea ice across McMurdo Sound during the austral summer. Eastward view with the active Mt. Erebus volcano on Ross Island in the distance. (1868-1947), the Rumanian zoologist; Henryk Arctowski (1871-1958), the Polish geologist; a Russian laboratory assistant; a number of Norwegians, including Roald Amundsen (1872-1928); and the complement of Belgian nationals. Beset in the pack ice in the Antarctic Peninsula region during the austral darkness, with supplies running low, Cook described the penguin meat that they were forced to consume: ''. . . if it is possible to imagine a piece of beef, odiferous cod fish and a canvas-backed duck roasted together in a pot, with blood and cod-liver oil for sauce, the illustration would be complete.'' The following year, the British Antarctic Expedition became the first to actually winter on the Antarctic continent, in northern Victoria Land—with Carsten Borchgrevink captaining the Southern Cross. The first serious attempt at the South Pole was lead by Robert Falcon Scott (1868-1912) on Discovery during the National Antarctic Expedition (Fig. 3.2). On 31 December 1902, after having traveled by dog sledge more than 5000 kilometers, Scott along with Ernest Shackleton (1874-1922) and Edward Wilson (1872-1912) reached 82°16' south. Six years later, Shackleton returned to Antarctica with the express purpose of reaching the southern geographical pole. Through blizzards and across deep crevassed glaciers, Shackleton and his team traveled as far as 88°23' south on 9 January 1909—just 180 kilometers from the Pole—before turning around in a life-and-death dash back to their encampment on Ross Island. In 1910, Scott once again headed southward, this time on the British Terra Nova Expedition. Just prior to this departure from South Africa, Scott received a telegram from the famed Norwegian polar explorer, Roald Amundsen: ''Beg leave to inform you, Fram proceeding Antarctica. Amundsen.'' The race was on (Fig. 3.3). Scott soon was moored in McMurdo Sound and Amundsen in the Bay of Whales, 97 kilometers closer to the pole. Scott's team also was at a technical disadvantage because they used ponderous motor vehicles and ponies that eventually failed, forcing them to manhaul their sleds toward the polar plateau. Amundsen's team, in contrast, used dogs to pull their sleds through their entire journey. Although both parties had laid food depots along their polar routes, Amundsen also shot his dogs for additional food. FIGURE 3.2 (Top) Scott's hut at McMurdo Station. The hut was built during the British National (Discovery) Expedition from 1901 to 1904. 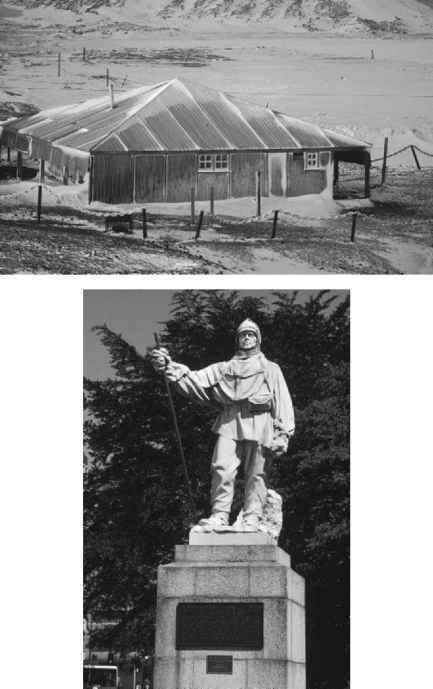 (Bottom) Statue in Christchurch, New Zealand, of Robert Falcon Scott, who perished with his team after arriving at the South Pole in 1912, one month after Roald Amundsen's first arrival on 14 December 1911. 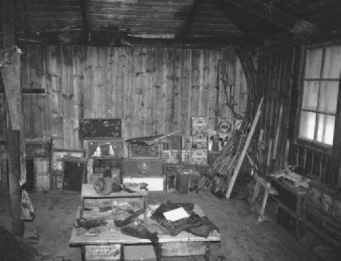 (Facing page) Inside of Scott's Hut in 1981, with mittens made from the fur of Weddell seals (foreground) along with tins of sledge-dog biscuits, skis, and other accoutrements (background). It was 11 a.m. when we reached our destination. While some of us were putting up the tent, others began to get everything ready for the coming observations. A solid snow pedestal was put up, on which the artificial horizon was to be placed, and a smaller one to rest the sextant on when it was not in use. ... It was very strange to turn in at 6 p.m., and then on turning out again at midnight to find the sun apparently still at the same altitude, and then once more at 6 a.m. to see it still no higher. The altitude had changed, of course, but so slightly that it was imperceptible with the naked eye. To us it appeared as though the sun made the circuit of the heavens at exactly the same altitude The observations soon told us that we were not on the absolute Pole, but as close to it as we could hope to get with our instruments. FIGURE 3.3 Race for the South Pole between Roald Amundsen of Norway (solid arrows) and Robert Falcon Scott of Great Britain (open arrows) with their crews of the Fram and Terra Nova, respectively. Scott manhauled sleds along the route established by Ernest Shackleton from McMurdo Sound in 1909, whereas Amundsen used dogs along an untested route from the Bay of Whales. On 14 December 1911, Amundsen and his team became the first humans to reach the South Pole. 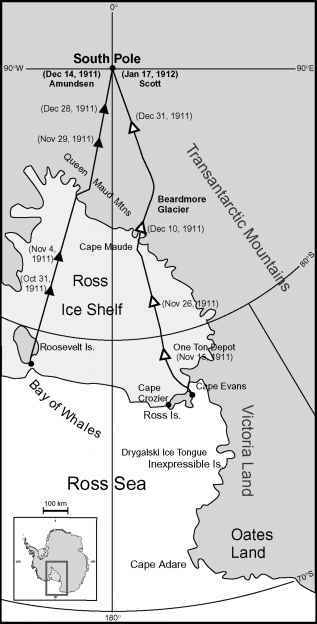 Scott and his team died on their return to McMurdo Sound after arriving at the South Pole on 17 January 1912. Adapted from Huntford (1979). a scene of whirling drift. I do not think we can hope for any better things now. We shall stick it out to the end, but we are getting weaker, of course, and the end cannot be far. It seems a pity, but I do not think I can write more. For God's sake look after our people. Men wanted for Hazardous Journey. Small wages, bitter cold, long months of complete darkness, constant danger, safe return doubtful. Honour and recognition in case of success. Shackleton and his crew planned to sail in the Endurance into the Weddell Sea and then traverse to the South Pole, across the Beardmore Glacier, and into the Ross Sea, where the Aurora would pick them up—2900 kilometers later. As fate would have it, none of Shackleton's crew ever set foot on the continent (Fig. 3.4). The Endurance was trapped in the sea ice where it lingered precariously for more than 300 days, through the long Antarctic night, before being mercilessly crushed. It was November 1915, the world was at war, and the 28-man crew of Endurance was given up for dead. There was no rescue party. The only means of survival was for Shackleton somehow to get his party back to civilization, across freezing seas, without a ship. Soon after, with great travail along the way, Shackleton arrived in the whaling village of Stromness on South Georgia. The effort required four attempts, but in the end all of Shackleton's marooned crew on Elephant Island were rescued alive. This epic tale of survival was among the final sagas in the heroic era (1901-1922) of Antarctic exploration. 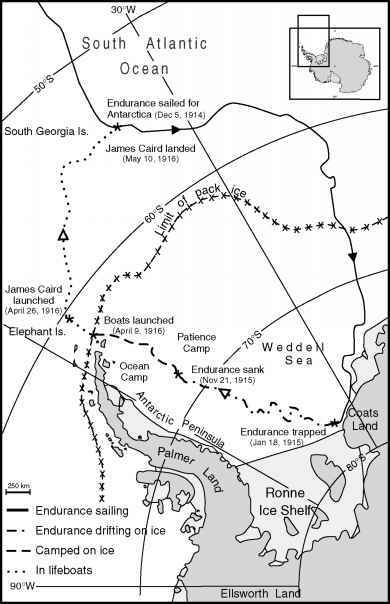 FIGURE 3.4 Amazing voyage of the Endurance crew lead by Ernest Shackleton after their ship was crushed in the sea ice before it even reached Antarctica to begin the Imperial Trans-Antarctic Expedition. All 28 members of the Endurance survived their 1914-1916 ordeal in the Antarctic Peninsula region. Adapted from Huntford (1985). (1888-1958) used aerial photography to map nearly 3000 kilometers of uncharted terrain in the Antarctic Peninsula region. Still, the ''reward of priority'' loomed large, and it was later in 1929 that Richard Byrd (1888-1957) navigated the first flight over the South Pole—a trip in 15 hours and 51 minutes that had taken Amundsen 3 months and cost Scott's party their lives: ''But you must have faith— you must have faith in the outcome, I whispered to myself. It is like a flight, a flight into another unknown.'' After millennia as Terra Australis Incognita, the continent of Antarctica was known. The issue of territorial jurisdiction is new nowhere on Earth. All nations have worked, contrived, and even battled over their authority. These sovereignty problems arrived in the Antarctic region along with national quests for priority and the early explorers' zeal for untapped resources. Within a decade of Cook's voyage across the Antarctic circle, Enderby Brothers of England began sending ships toward Antarctica to harvest the vast seal populations that had been identified on islands between Terra del Fuego and the Antarctic Peninsula. Within 30 years, the fur seals (Arctocephalus species) on South Georgia were virtually eliminated. As the sealers moved on from South Georgia with experience and a vigorous industry, the demise of the fur seal on the South Shetland Islands took only a few years (Chapter 10: Ecosystem Conservation). During the early 19th century, sealers also began wintering on subantarctic islands that had been recognized as strategic national outposts throughout the previous century. In 1820, the United Provinces of Buenos Aires claimed the Falkland Islands south of Cape Horn between 51° and 53° south. With the Argentine appointment of Luis Vernet (1792-1871) as governor of the Falkland Islands in 1828, territorial interests escalated into altercation as he imprisoned British and American sealers for poaching. Angered by this high-handed action, in 1831 the United States Navy sent the corvette U.S.S. Lexington down to the Falkland Islands, where it destroyed the settlements, expelled the principal residents to Buenos Aires, and pronounced the islands ''free of all government.'' The British navy followed suit and in 1833 sent down H.M.S. Clio and H.M.S. Tyne to hoist the Union Jack. Soon after, a rogue band of Argentine gauchos murdered several residents, including a British citizen who had worked with James Weddell. Curiously, it was also during this time that the H.M.S. Beagle arrived in the Falkland Islands with Charles Darwin (1809-1882).
. . . the Governor of the Colony of the Falkland Islands to be Governor of South Georgia, the South Orkneys, the South Shetlands, the Sandwich Islands and Graham's Land, and providing for the Government thereof as Dependencies of the Colony.
. . . all islands and territories whatsoever between the twentieth degree of West longitude and the 50th degree of West longitude which are situated south of the 50th parallel of South latitude. This claim, shaped like a wedge converging at the South Pole, was based on the ''sector theory'' from the Arctic where nations extended their territorial boundaries to the North Pole. The major difference, however, was that Antarctica was a continent surrounded by ocean, unlike the Arctic, where contiguous national lands enclose an ocean. What are the benefits and problems with national claims to Antarctic territory? 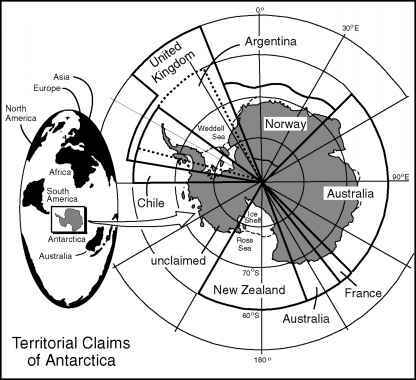 As if slicing a pie, nations began claiming sectors of Antarctica (Fig. 3.5). Expanding its empire, the British government, by Order-in-Council gave the Ross Dependencies to New Zealand in 1923, based on the historic efforts in the region by Ross, Scott, and Shackleton. The following year, the French claimed a small sector of East Antarctica based on the voyage by Jules-Sebastien-Cesar Dumont d'Urville (1790-1842), who had named Terre Adelie for his wife in 1840. The British then countered in 1933 with another Order-in-Council, which claimed sectors on both sides of the French claim, based in part on the British Australian New Zealand Antarctic Research Expedition (BANZARE) of 1929-1931. Despite their colonial histories, in 1938, these four nations mutually recognized each other's claims to strengthen their individual assertions of territorial sovereignty. 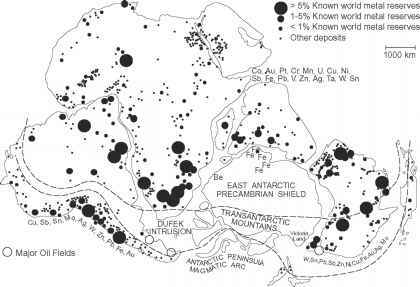 FIGURE 3.5 Sectors of Antarctica were claimed by seven nations during the 20th century: England (1908 and 1917); New Zealand (1923); France (1924); Australia (1933); Norway (1939); Chile (1940); and Argentina (1943). The only overlapping claims are between England, Chile, and Argentina in the Antarctic Peninsula region. Other nations reserved the rights to make territorial claims, including the United States, which had expressed sovereign interests in the only unclaimed area of Antarctica in Marie Byrd Land. The polar projection shows the geographic location of Antarctica relative to the other continents (Fig. I). Modified from the National Foreign Assessment Center (1978) and Berkman (1992). mately, the United States decided to reserve the right to make its claim, creating Marie Byrd Land as the only unclaimed sector of Antarctica. Land region, which Norway considered as her territory, King Hans van Marwijk Haakon VII (1872-1957) claimed the region between 20° west and 45° east in 1939 based on the preeminent success of Amundsen. All lands, islands, islets, reefs of rocks, glaciers (pack-ice), already known or to be discovered, and their respective territorial waters, in the sector between longitudes 53° and 90° West, constitute the Chilean Antarctic or Chilean Antarctic territory. The biggest difficulty with the three overlapping claims in the Antarctic Peninsula sector (Fig. 3.5), however, has remained between Great Britain and Argentina. Their Falklands-Malvinas war in 1982 is an acute reminder that territorial interests remain today as the major challenge to peace in the Antarctic region.